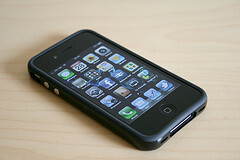 I picked up some good tips from Poynter’s live chat on using an iPhone as your sole reporting device. MSNBC.com senior multimedia producer Jim Seida, who has used the iPhone as his only reporting device, answered questions and gave excellent advice. You can read back through the questions and answers here. With an election on the cards soon in Ireland, this article from the Columbia Journalism Review of US Midterm election coverage is well worth reading for tips. It looks at the coverage by smaller circulation papers’ (however these are still substantial publications like the San Jose Mercury News and The Dallas Morning News). Finally, Adam Westbrook is very generously giving two chapters of his book ‘Next Generation Journalist: 10 New Ways to Make Money as a Journalist’ away for free via his website. It has some good tips on creating an online portfolio and setting up a personal website. By the way, you can find me on Twitter.